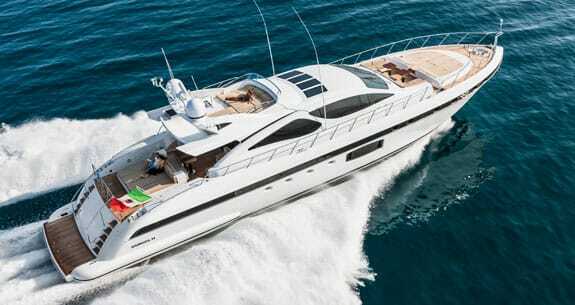 Speedy, stabilized, and superlative, the Mangusta 94 from Overmarine signals another step in the fascinating evolution of this semi-custom builder. They say it’s better to travel hopefully than to arrive, but in the case of Cannes, sometimes it’s good to arrive in order to leave. Don’t get me wrong—Cannes is a great little town, and the annual Festival de la Plaisance is not just my all-time favorite boat show, but pretty much everybody else’s too. It’s just that this year as I arrived, on the usual crowded airport bus, after a 4:00 am start, possibly missing a shoe, I knew that in just a few days I’d be leaving aboard something pretty special. It was sort of the opposite of Cinderella. 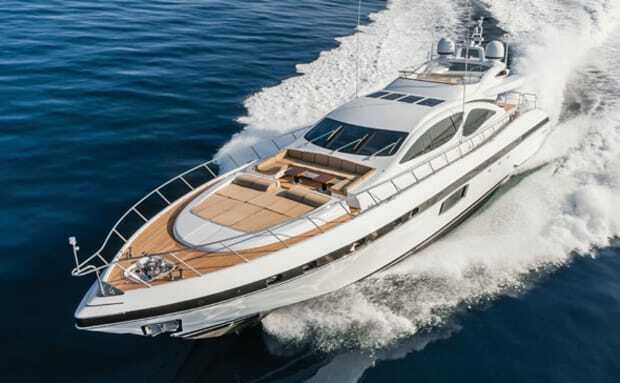 That something was the new Mangusta 94, and I had been invited to join the yacht after the show for the trip back to her home port of Beaulieu-sur-Mer. 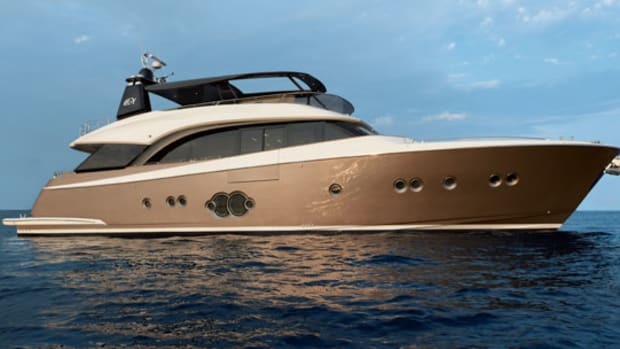 This most civilized of Cote d’Azur yacht harbors might only be a 30-mile hop down the coast from Cannes, but fleeting as it might turn out to be, I knew a mini-cruise would give me a rare flavor of this ultimate fast passagemaker. 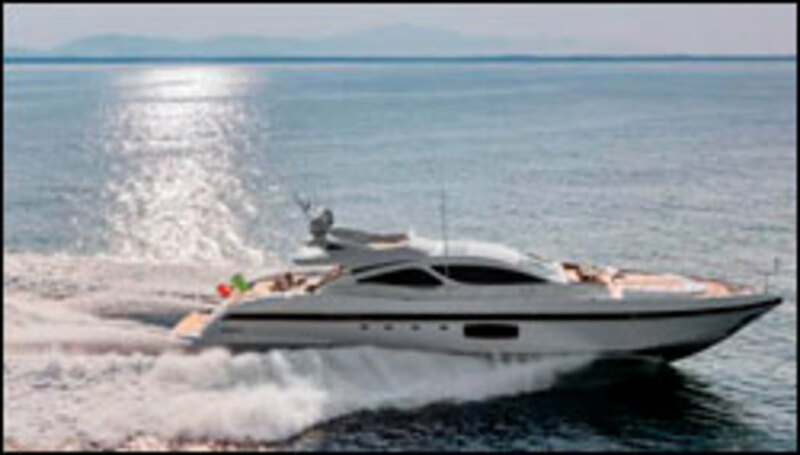 A new Mangusta is always something of an event. Overmarine is an old-school shipyard that brings out new models at a pace dictated by its designers, engineers, and customers, rather than according to the largely imaginary market pressures that motivate many boatbuilders. A typical model life cycle is at least eight years, and the 92 that this yacht replaces lasted from 2003 to 2012, with 28 built. Another policy that underwrites the yachts’ resale value is the styling, which really doesn’t change much (see “Color Scheming,” opposite). 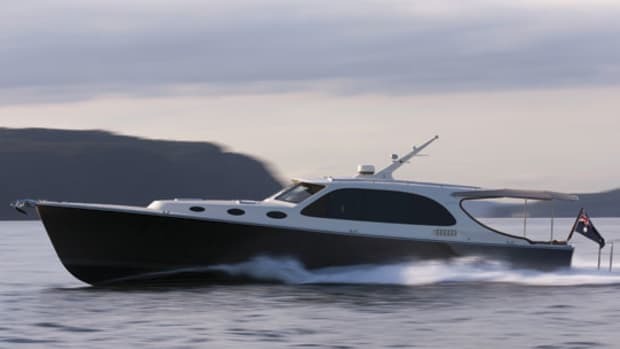 New Mangustas look very much like old Mangustas, although today’s are all built to MCA specifications, whether their owners intend to charter them or not. In a 28-year history, the company has constructed just over 300 yachts. 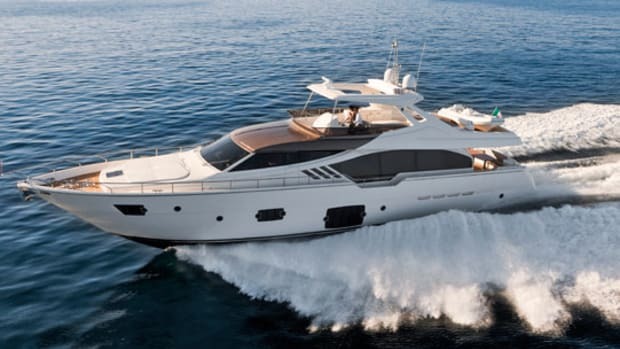 The policy that probably does most to please Mangusta customers is the options list on a new yacht. If there is one, it’s very short—the shipyard builds strictly to order, and the basic principle is that pretty much everything you want, from a list of approved suppliers, is included in the price. 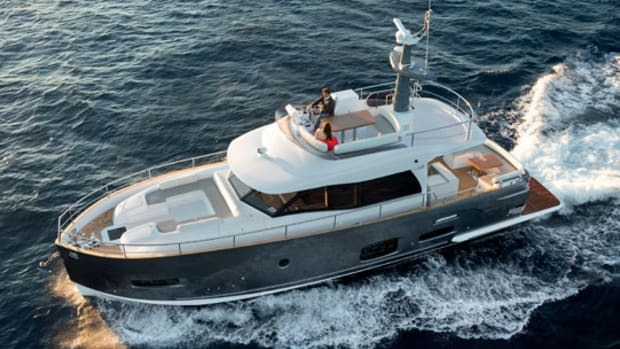 Our 94, the second built by Overmarine, had an Item Mare gyrostabilizer fitted—the only other options offered were an electrical frequency converter, and a helm station on the flying bridge. 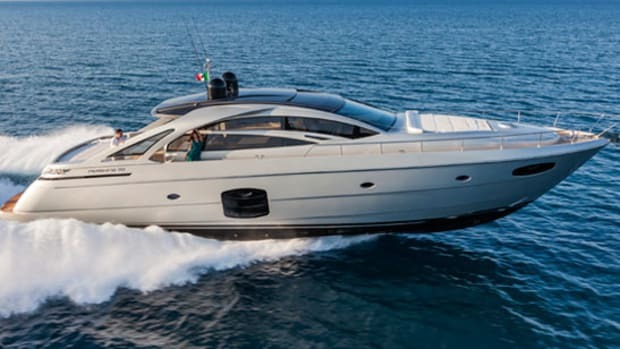 That flying bridge is the most obvious difference between the 92 and the 94, which share the same hull design, but in fact the entire superstructure of the 94 is new, with its molded foredeck relaxation area replacing a simple sunbed. Downstairs, the standard layout is much the same as that of the previous model, but this being Overmarine, the published plans are really just suggestions. Rather than the standard four-cabin arrangement, this yacht had three. The first 94 had just two. Most Mangustas are finished in white—it’s a watchword within the shipyard that if a yacht looks beautiful, it looks most beautiful in white. The glossy finish that you see on the new 94 is not gelcoat, but DuPont’s Imron topcoat in “Snow White,” a high-performance paint for spray application that is designed to be resistant to chemicals, weathering, acids, and abrasion, and if regularly polished apparently comes up like new for years. To every one of its yachts, Overmarine applies no fewer than 12 coats of this high-tech polyurethane, which you won’t find in your local chandler as it’s sold for professional use only. As we waited in the narrow dock at Beaulieu for the hoist to do its work, another Mangusta, quite by coincidence, eased its way into the next dock along. It was a gleaming 108 and looked brand new, and could easily have come, like us, straight from the boat show. In fact it turned out to be 13 years old. You could have fooled me. The private lower saloon, which this owner had specified in place of the port guest cabin, is an excellent feature, and well worth the sacrifice of a sleeping accommodation. Everything down below, including the engine room, is built on a grand scale, with an emphasis on cat-swinging space and generous headroom. The full-beam master suite feels particularly roomy, with its huge, one-piece hull windows and superb walk-in wardrobe, beautifully compartmentalized. 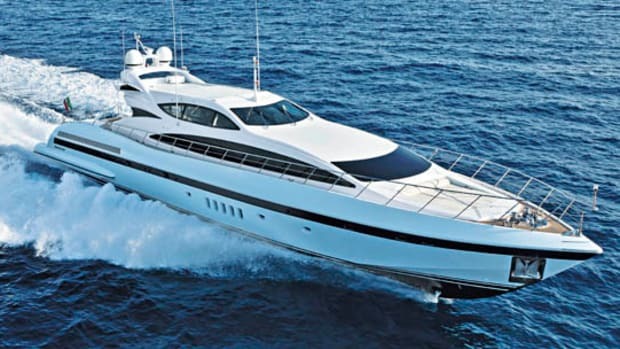 There is a VIP suite in the bow, and the third cabin, to starboard, is a well-proportioned twin. Two crew cabins aft are reached via a port-side companionway, and the galley is belowdecks too, allowing the informal main-deck layout to feel even more relaxed—except for the helm station, of course, which is as intimidatingly businesslike as you’d expect. The engines, coupled to jet drives, are mounted aft—but there is still a garage big enough, just, for a Williams 385 jet RIB. This owner’s choice of décor worked well, I thought: dark hardwood floors, white leather deckhead linings, and detailing in brown leather and lizard skin, with colorful cushions to lift the mood. Your choices will not only be different, but pretty much as different as you wish. The four skylights in the saloon are a cool feature—LED glass, so you can turn the sky on and off. We were happy to keep it on. After a breezy Sunday afternoon that whipped up 4- and 5-foot seas in the Baie de Cannes, Monday dawned clear, calm, and blue. The 94’s captain, an urbane Frenchman in shades, eased the big yacht out of her berth, where for the last week she had hosted a stream of boat-show visitors. In spite of his unflappably professional demeanor we were on a pretty tight deadline—the Mangusta was due in the slings at Beaulieu at 11:00 sharp. After a summer’s cruising, she was coming out for maintenance. As we crept towards the mouth of the old port of Cannes, jostling for elbow room through chaotic post-show traffic, the remnants of Sunday’s blow could be seen in a lazy lop on the water, maybe 3 feet high, but with long wavelengths and no real energy. For a 90-tonner measuring nearly 80 feet on the waterline, it was effectively a calm day. We took it steady until clear of the islands, and then opened her up. Although the 94 is fitted with a conventional steering wheel, taking control using the weird-looking KaMeWa jet controls soon becomes instinctive, especially if when under way you synchronize them and just use one. The hand fits naturally around the oddly tactile orb, while the throttle lever is just an index finger away. A soft detent confirms when the helm is centered. It could hardly be easier. And the 94 responded. 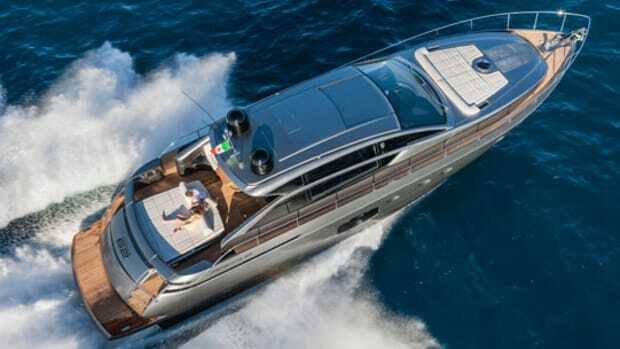 In a performance trial that clocked a two-way average of exactly 37 knots, the big yacht displayed exemplary handling, heeling hard into the turns, ironing out what waves there were with its deep forefoot, and accelerating with real urgency. Sound levels on the main deck were comfortable and the ride was solid—after handing control back to the captain I found I could make legible notes sitting at the table, even while the yacht barrelled eastward at an urgent 35 knots towards its appointment with the dockmaster. Before long we were rounding Cap Ferrat and heading in past the stone breakwater. The marina crew were waiting. From the flying bridge I watched amazed as the 94’s beamy snout edged into an impossibly small dock, with clearance each side of just 16 inches. The captain didn’t break a sweat. In a slower boat you could have made a morning of it. In the 94 it was indeed a fleeting cruise. But I wouldn’t have missed it—if nothing else it made up for my dishevelled arrival in Cannes. If you can’t arrive in style, I reflected, at least try to engineer a classy departure. NOTEWORTHY OPTIONS: Item Mare gyroscopic stabilizer ($162,000). 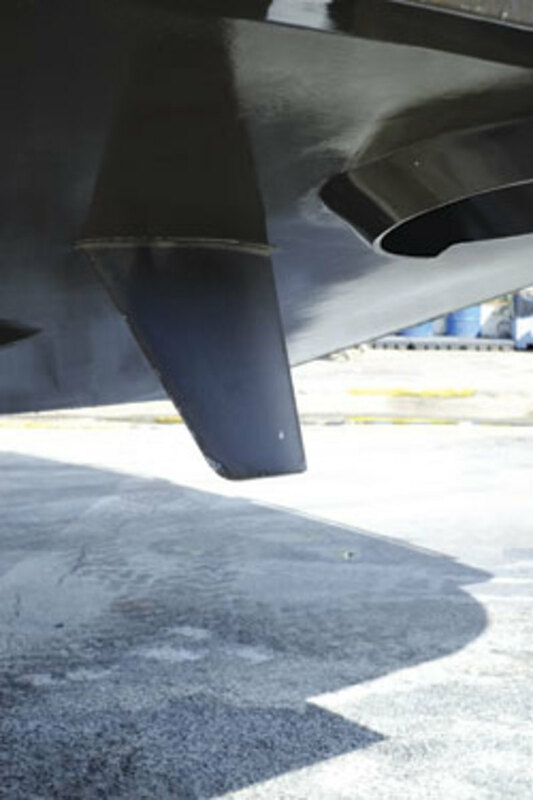 Jet drives and surface drives are popular in high-performance craft because they minimize the appendage drag of shafts, rudders, and props. But that very lack of appendages can create handling problems, as the stern ends up with very little grip in the water—something I once discovered the hard way on a 70-footer when the back end flipped out during a 30-knot turn, upending everybody and snapping off one of the satcom domes. It wasn’t a Mangusta. 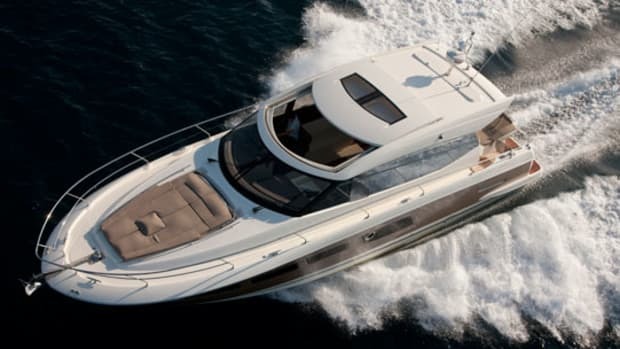 To counter this problem, the 94, along with other models in the range, is fitted with a pair of surfboard-like fins at the stern, midway across the bottom panels and in line with the jets. They’re surprisingly small but extremely effective, ensuring that the yacht behaves itself at high speed, whatever you’re doing up at the helm. 705 gal. fuel, 343 gal. water, 5 persons, 1,300 lb. gear. 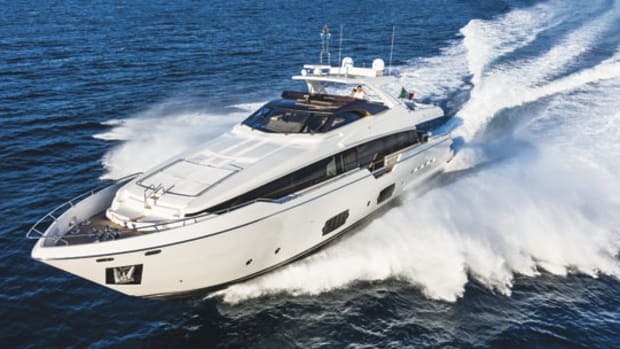 This article originally appeared in the November 2013 issue of Power & Motoryacht magazine.